Vice President Dr. Mahamudu Bawumia and Ghana’s Economic Management Team (EMT) will today hold a maiden Town Hall Meeting to address challenges facing the economy. The event will give Ghanaians the opportunity to ask questions on issues such as import duties, the exchange rate, matters on energy, the broader economy, and government’s flagship projects. Dr. Bawumia is expected to shed more light on how the government intends to make Ghana the digital hub of the West African sub-region. He will be speaking on the theme “Our progress, Our status, Our future” at the College of Physicians and Surgeons. He chairs the nine-member team consisting of Senior Minister Yaw Osafo Maafo (Vice Chair), Mr. Ken Ofori-Atta (Finance Minister), Dr. Owusu Afriyie Akoto (Agric Minister), John Peter Amewu (Energy Minister), Prof. George Gyan Baffour (Minister for Planning), John Alan Kwadwo Kyerematen (Minister for Trade and Industry), Dr. Anthony Akoto-Osei (Minister for Monitoring and Evaluation), and Prof. Joe Amoako-Tuffour (the Secretary). The Economic Management Team meets on Tuesdays and invite various government agencies, the private sector and different stakeholders to have fruitful discourses that shape government economic policies. “So far, there is no doubt that the EMT’s efforts have helped to shape well policies of the government and delivered on key economic milestones of President Akufo-Addo’s government,” secretary of the EMT said. According to some members of the EMT, the Town Hall Meeting is part of the broader scope of President Akufo-Addo’s government to enhance inclusive governance and bottom-up decision making. 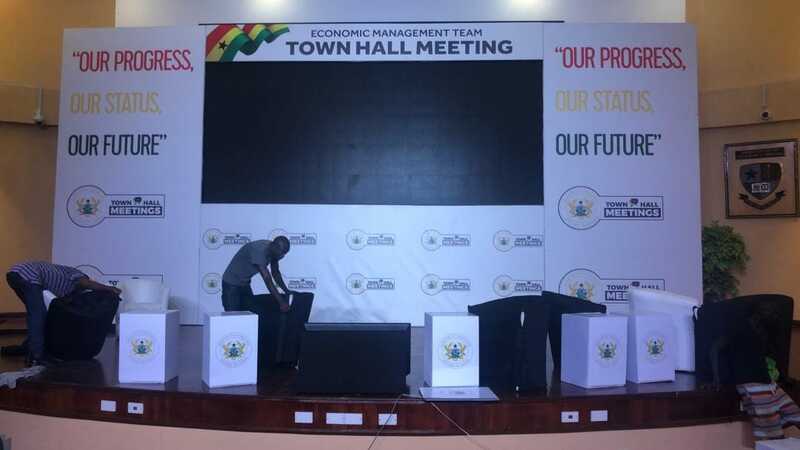 According to the Spokesperson to the Vice President, who doubles as a member of the EMT Secretariat, Dr. Gideon Boako, the Town Hall Meeting will be largely questions and answers-based to enable the Ghanaian people the chance to be heard and be part of government decision processes.